We here at DorpatSherrardLomont are pleased to announce the first installment of our newest feature ‘Our Daily Sykes’. Photographer Horace Sykes (a member of the Seattle Photography Club) wandered the northwest for decades seeking the picturesque and the profound, snapping shots of flowers, snowstorms, mountains, valleys, and plains. Paul has a large collection of these marvels and has used a number of them in Seattle Now & Then – and several in his and Jean’s recent book Washington Then and Now. Sykes’ keen eye captured visual treasures during the 40s and 50s, but most of his photos are without annotation, which often leaves us guessing at location. Hence, we propose a kind of collaboration with our readers. We will, as the title suggests, offer a daily Sykes photo; some will be well-known locations, others obscure or unfamiliar. If you know where a photo was taken, please let us know; and if the urge takes you, perhaps even attempt your own repeat. 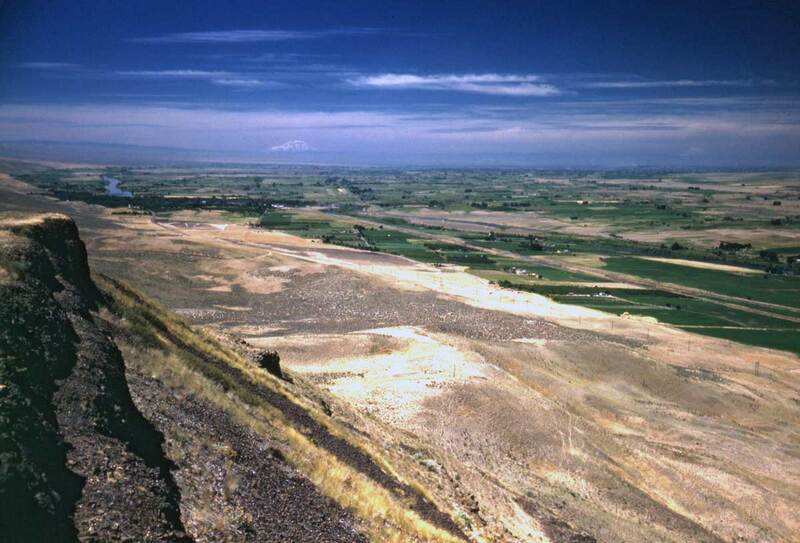 Above is Jean’s beloved Yakima River Valley. There you can see Mt. Adams off in the distance and even through the summer haze some of Mt. Rainier on the far right horizon. But where this is in the valley, and how close to Sunnyside, Jean’s frequent destination, we do not know. We would ask any reader who does know and can identify the location of the bluff on the left to step forward. Paul will provide the cookies.